SANBORN & CARTER’S PATENT BACKING MACHINE, 1853-1860. The first patented backing machine may have been unworkable: in William Laighton’s design of 1845 a concave block or roller was pushed along the axis of the spine. Charles Starr’s machine of 1850-1851  was successful in England, but not in his own America. The Starr backer established the principal of a massive roller parallel to the spine and working back and forth across it. Starr, however, rotated the book under the roller; later designs hold the book steady and pull the roller back and forth across it. Most backing machines derive from John Elder’s patent of 1853. This was soon taken over by George Henry Sanborn of Portland, Maine and described as “Sanborn & Carter’s Patent Machine for Backing Books” or as “Mr. 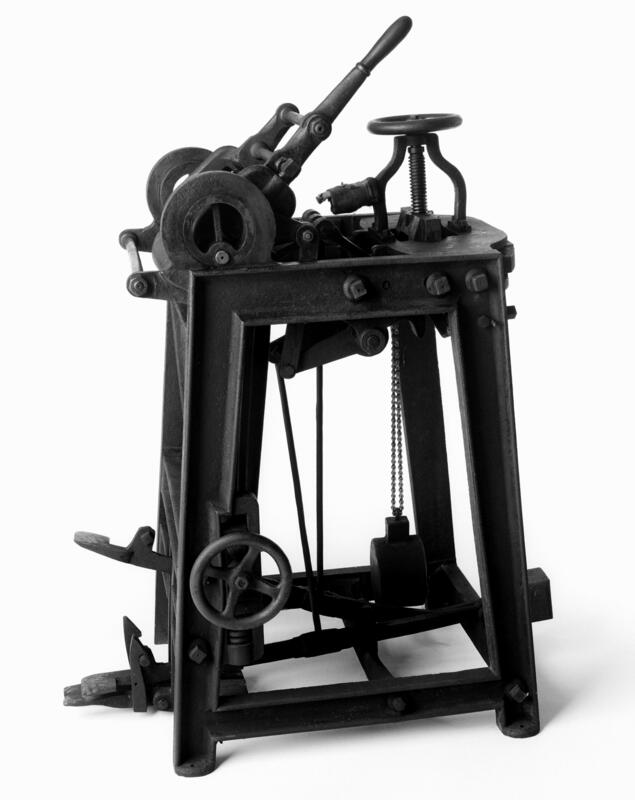 Sanborn’s machine.” Our example corresponds closely to the patent drawings, an undated (but circa 1856) illustration in Pilkington’s Artist’s Guide and Mechanic’s Own Book, and a similar illustration in Nicholson’s Manual of the Art of Bookbinding (1856). Differences between the four are mostly in the arrangement of counterweights or springs in the undercarriage. Around 1860 Sanborn moved manufacture of the backer and his other equipment from Maine to the Standard Machinery Co. of Mystic, Connecticut, and at this time the roller length was increased from 13″ to 17-1/2″; this gives a firm 1853-1860 bracket on our example, which has the short roller. George Henry Sanborn (1830-1881) learned bookbinding and printing at Sanborn & Carter, his father’s publishing firm in Portland, Maine. He is said to have gone into business for himself at around 22, and soon specialized in bookbinding machinery. George H. Sanborn & Co. (later & Sons) moved from Boston to New York in 1867 or 1868, and opened a branch office in Chicago in 1879. It is clear that Sanborn almost immediately claimed invention of the backing machine, freezing John Elder out of the credit. In addition to the backer, Sanborn seems to have made a specialty of cutting machines. Several patents were issued for rounders and combined rounder-backers in the 1850s, but rounding proved harder to mechanize than backing and none were successful. The “Sanborn” backer was accepted, but slowly, and the crumpled gutter of poor hand backing can still be seen in some edition-bound books of the last quarter of the 19th century. In 1891 Crawley’s power rounder-backer, capable of 450-700 books per hour, superseded hand rounding and the Sanborn backer for large edition work, though both hand backing and the roller backer remained in use for short runs. #9,886, July 26, 1853. “Curving the Backs of Books.” John A. Elder of Westbrook, Cumberland County, Maine. “Death of Charles Henry Sanborn.” New York Times. (Friday, January 28, 1881), p. 8. “Suicide of Joseph S. Sanborn.” New York Times. (Thursday, June 22, 1882), p. 3. “George H. Sanborn,” in: American Dictionary of Printing and Publishing. New York: Howard Lockwood & Co., 1894, p. 499-500. Comparato, Frank. Books For The Millions. Harrisburg, Pennsylvania: Stackpole, 1971, p. 109-111. Middleton, Bernard. A History of English Craft Bookbinding Technique. 4th. ed. Willmington, Delaware: Oak Knoll Press, and London: British Library, 1996, p. 234-235. Pleger, John J. Bookbinding. Rev. ed. Chicago: Inland Printer, 1924, p. 156-163. We are indebted to Steve Beare for assistence in researching Carter & Sanborn and Pilkington’s Artist’s Guide and Mechanic’s Own Book. Starr’s design was patented in England in 1850 but described there as an American machine; the basic machine was not patented in America until 1851 (five months after an attachment for it was patented), clearly due to a greater lag time in the American patent process. See Middleton p. 235. This is on the authority of Frank Comparato p. 109-111, apparently drawing his information from an article on George H. Sanborn somehere in the run of American Bookmaker magazine. Unfortunately, Comparato is flagrantly careless about details, and because of this the 1860 date must be regarded as tentative until his source can be found. Other details confirm an early date for our example, for instance its construction from smaller, simpler I-section castings bolted together; in later binding equipment the castings are larger and more complex. On the left and right of our roller carriage there are several areas crudely broken or chiseled away to give clearance for large nuts on the frame (possibly the modification was made on the casting pattern); this crude modification, which seems necessary for the operation of the machine, also suggests an early date and experimental model, rather than a refined and completed version. Some other modifications have been made, especially in the replacement of an original leather strap (one for a pair of heavy counterweights) with a bicycle chain. Sanborn & Carter was active in Portland and Boston in the late 1830s, 1840s, and 1850s. From at least 1856 Sanborn alone is named as inventor in descriptions; Elder’s name is found only on the patent itself.